Klang, the royal town of Selangor, is located just about 1-hour drive from Kuala Lumpur but it is so underrated it hardly gets recommended as a day trip destination for those visiting the capital city of Malaysia. This is very unfortunate, if you ask me, as this old town, the first capital of Selangor (before it changed to Kuala Lumpur and subsequently to Shah Alam after Kuala Lumpur was declared a federal territory), has a wealth of treasures to offer to visitors. My first time visiting the town as a “tourist” was a few years back when I joined Tourism Selangor’s popular #TSDayOut programme - a day-out programme to promote various interesting places in Selangor - to Klang, probably back in 2012. I have since been there again and again with Tourism Selangor during the #MySelangorStory programme in 2013 and #TSDayOut Special Edition in 2015. In between, I’ve also played “tourist guide” in Klang, to fellow travel bloggers from outside Malaysia like Edgar of eazytraveler from the Philippines and Talon & Tigger of 1dad1kid from the United States. During each and every single of these visits, I’ve always discovered something new, not literally, but something that I’ve never explored and perhaps knew before each visit. Klang basically keeps on surprising me every single time I pay the town a visit. Thus, it is not surprising perhaps that the same thing happened when I visited the royal town again recently during the recent #EatTravelWrite programme. Klang Municipal Council has been offering a free, guided Royal Klang Heritage Walk every weekend for a few years now. It’s something that I’ve been meaning to join (hey, it’s free after all!) but never got around to, until recently. The Heritage Walk initially covered 24 places and landmarks around the town when it first started but this was subsequently reduced to just 12, to allow for a more relaxing pace and a better appreciation of the heritage during the 2.5-hour walk. If you’re keen for access to and inside stories behind each of these places, the free Heritage Walk is the way to go as you’d have a professional tour guide with you throughout the walk. If on the other hand, you’d like to take more time at one or the other places/landmarks (for photography, for example), you can easily tailor a DIY walk and incorporate more than the 12 places covered in the official Royal Klang Heritage Walk. This blog post would cover the official Royal Klang Heritage Walk, with tips and suggestions for other places and landmarks which are not covered during the Heritage Walk too. These places and landmarks would be denoted as such in the list below. The post, therefore, should still help if you’d like to explore more and are thinking of doing a DIY Heritage Walk in Klang. The Royal Klang Heritage Walk starts at Sultan Abdul Aziz Royal Gallery, where participants gather to register and listen to a short briefing by a professional tour guide. After the briefing, participants are brought inside the Royal Gallery that has been dedicated to the works and life of the late HRH Sultan Abdul Aziz, the previous Sultan of Selangor and father of the current one. The beautiful early 20th-century building in which the Royal Gallery is housed in was actually built as the British colonial administrative office by AB Hubback, the guy behind the many iconic heritage buildings in Kuala Lumpur, including Sultan Abdul Samad Building, Jamek Mosque and the old KL Railway Station. This stately building no doubt has seen a colourful history over the years before it was turned into a Royal Gallery, but the exhibits on display inside perhaps even more so. One of them, which I probably like the most, is the skull of a crocodile captured about 3 months after the coronation of the late Sultan back in 1961. As the story goes, it is said that the crocodile surrendered itself as a mark of respect for the then newly crowned Sultan. Located just across the road next to the Royal Gallery is Chennai Silk Store, housed in another stately building that was built in the second half of 19th century. This neo-classical building used to be the office of Chartered Bank, the oldest bank in Klang. Going inside the Store, visitors would note the grand staircase inside that leads up to the second floor of the building where the bank’s service counters used to be. These days, the building is filled with colourful sarees, of which some are very exclusive (and not to forget, expensive! ), it’s not a bad idea to explore the Store and see them for yourself. If you’re lucky, you might be able to see a staff working on some silk threads the traditional way. Going out of the Old Chartered Bank Building and walking up the slope along Jalan Istana, you’d arrive at Kelab Diraja Klang (Royal Klang Club), a social & recreational club established at the turn of the 20th century for the British folks in the then Malaya. The “Royal” status of the Club, however, was granted much later. From Kelab Diraja Klang, a further slight uphill walk would bring you to Istana Alam Shah, the official palace for Selangor’s royal ceremonies and investitures. Built in the mid-20th century, this Palace is open to the public twice a week for a visit, which includes a guided tour of some rooms and halls in the Palace building, Muzium Bolasepak (Football Museum) Istana Alam Shah and a tour of the Royal Automobile Gallery. The Palace tour, however, is not covered during Royal Klang Heritage Walk. You’d just have to make do with taking photos of the Palace from the outside, and also maybe with the guards at the main gate. From the main gate of the Palace, we crossed the road and had a “walk in a park”, literally. At one end of the park is Tugu Keris, a monument in the form of a traditional Malay dagger called keris. If you’re on a DIY heritage walk, cross the road and head over to Persiaran Kota for Kwan Imm Temple, a popular Buddhist temple with a very interesting architecture, for a photo stop before retracing your steps back to Jalan Tengku Kelana for the next stop. Just across the road and not far from Tugu Keris, you’d find a mini Notre Dame of Paris. This Gothic architecture, however, is known as Church of Our Lady of Lourdes, a Catholic church built in the early 20th century initially to cater for the Indian Catholic community who have settled down in the area. Right next to the church is a school building that is home to 3 different convent schools: Klang Convent (1) Primary School, Klang Convent (2) Primary School and Klang Convent Secondary School, established just a few years after the church was built. A short straight walk along Jalan Tengku Kelana from the church and the convent schools would bring you to Klang’s Little India. Once you’re here, all your senses are guaranteed to be working overtime. Your eyes would feast on the colourful billboards, striking coloured sarees, gold & jewellery, spices, Indian desserts, snacks and whatnot; your nose would be hit by the smells of spices, flowers from the garlands, and perhaps curries from the many restaurants that occupy either side of the street; and your ears would be bombarded with the booming sound of popular Bollywood songs as well as the voices of traders (on loudspeaker) enticing passers-by with their latest discounts and promotions. In the days leading up to Deepavali (Indian Festival of Lights), this Little India would easily turn into one of the busiest and most festive shopping avenues in the country. On a side note, what is perhaps an interesting trivia is that this Little India, which is Malaysia’s largest, actually grew out of an old Chinese settlement. Located at the main junction of Little India is a mosque – Masjid Tengku Kelana - that is more commonly known as Masjid India Klang or Klang Indian Mosque. 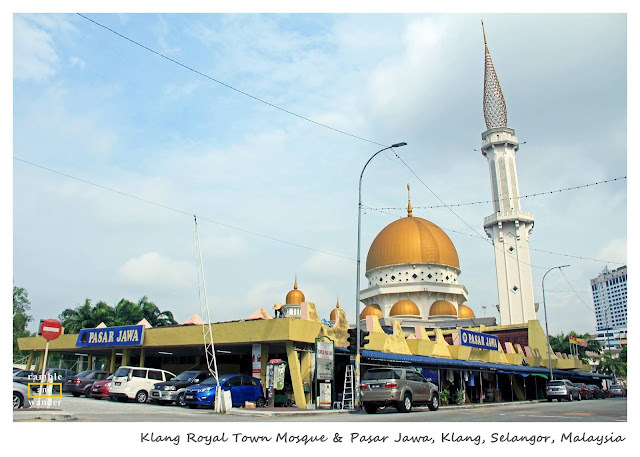 Originally established in the early 20th century for the Indian Muslim community in the area, the mosque has undergone several stages of transformation before turning into the grand building and one of the major landmarks of Klang that it is today. Not far from the Indian Mosque is the oldest, and richest, Hindu temple in Klang. Sri Nagara Thendayuthapani Temple was built in 1925 for the Indian Hindu community. This Hindu temple and the Indian Muslim Mosque are neighbours with a Christian chapel/ complex building, and they actually share the same open space car park that is located right in between the three of them - something that some might find interesting and unique, apart from the landmarks themselves. If you’re on a DIY heritage tour, instead of turning right for Klang Fire Station, take Jalan Raya Barat to get to Kota Raja Mahadi (Raja Mahadi Fort) and Jambatan Kota (Kota Bridge). To get to do this, you’d need to walk pass underneath Jambatan Kota (the motor vehicle bridge part) and take the road that’s located on the left right after the bridge, which would bring you to the (upper deck of the) bridge. Before you get to the upper deck of the bridge, however, there is the historical Kota Raja Mahadi (Raja Mahadi Fort) located right on your right-hand side as you walk along the steep short road up the small “hill”. The Fort was built in 1866 by Raja Mahadi ibn Almarhum Raja Sulaiman during his power struggle against Raja Abdullah for the control of Klang district, which used to be under his late father’s control. The civil war ended only about a year later when Raja Abdullah went into retreat. In 1868 however, after 6 months of some bloody battles during the second civil war, the Fort fell into the hands of Tengku Kudin, who was avenging him on behalf of the Sultan of Selangor for failing to pay his debts to the Sultan. It then became the residence of Tengku Kudin for the next 30 years. The Fort, however, is closed to the public at the moment. The upper deck of Jambatan Kota is perfect if you’d like to take some photos of Masjid Bandar Diraja Klang (Klang Royal Town Mosque), with its yellow-coloured domes, located on the bank of Klang River. 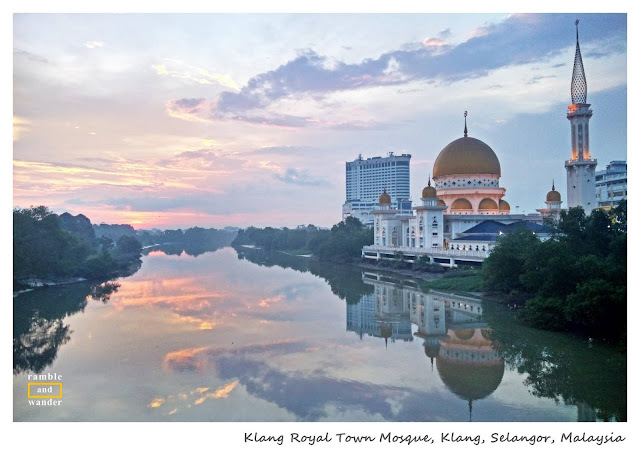 On a good day, the reflection of the mosque in Klang River waters is enough to make for a good photo but personally, I’d recommend going there, if possible and weather permitting, at around sunset time. Jambatan Kota (Kota Bridge) is a double-decked pedestrian & motor vehicle bridge – the first in Malaysia - that was officially opened in 1961. After capturing some photos of Masjid Bandar Diraja Klang from the upper deck of the bridge, it’s time to take the staircase to the lower deck where you can better appreciate the original part of Jambatan Kota, and perhaps see some monkeys as well. From here, you can choose to either cross Klang River or retrace your steps back and head directly to Klang Fire Station. If you choose to cross the river, you can turn left at the end of the bridge onto Jalan Pasar and see Masjid Bandar Diraja Klang closer. Just before the mosque, there is Pasar Jawa (Javanese Market), which you might like to explore as well if you have the time. Tip: Across the road from Pasar Jawa there is a food court called Emporium Makan where you can find a good bowl of lontong that is popular among the locals here, at Lontong Klang stall. However, the timing of your visit here might be a bit off as they serve this only in the morning until around 11 am. Afterwards, you can either get back on Jambatan Kota or walk straight along Jalan Pasar until you get to Tengku Musaddin Bridge from where you can walk across the bridge towards Klang Fire Station. I’d recommend the latter as you’d be able to see the minarets and the big dome of Indian Muslim Mosque from afar. Klang Fire Station is housed in a small, white & red Victorian building that was built in the late 19th century. The colours actually reminded me of the Japanese flag and it crossed my mind that the sun and its rays (as symbolised through the design and colours used on the building) were of the Japanese rising sun, a “memento” following their occupation back in the 1940s. However, I found out that they actually epitomise the belief (at the time the Station was built, i.e. late 19th century) that the sun never sets on the British Empire. So nothing Japanese about that, I’m afraid. Just two doors down from Klang Fire Station is one of the oldest Malay buildings that are still standing in Selangor. Built in 1857, it was the residence of Raja Abdullah – the Chief of Klang at the time – with his family. The ground floor, however, was used as a warehouse (“gedung”, in Malay) for weaponry, ammunition, tin ore, mining implements and supplies. Subsequently, Gedung Raja Abdullah had also served as the HQ for the first British Resident, state treasury, as well as survey, land and post office. In fact, this was where the first council meeting of Selangor took place. In 1880, it became a police station and remained so for almost a century. In 1985, about a decade after the police station moved out, the building was turned into a museum but the place, however, has been closed to the general public for a few years now for restoration work by Malaysia’s National Heritage Department. Perhaps during this restoration work, the workers involved might stumble into the much talk-about rumour of a secret tunnel that connects Gedung Raja Abdullah and Kota Raja Mahadi. From Gedung Raja Abdullah, it’s a straight walk along Jalan Besar, the first high street in Klang, which leads to Klang Railway Station, one of the first railway stations in Malaysia. Tip: If you’re still looking for banana leaf rice, do check out Yap Kee Coffee Shop (map) on Jalan Besar here. It’s a small Chinese coffee shop that has a little Indian stall inside that serves good banana leaf rice. For a refreshing drink, ask for kedondong juice. Klang Railway Station is where you’d get off at if you’re coming from Kuala Lumpur by train. From here, it’s just a short walk back to Sultan Abdul Aziz Royal Gallery, where Royal Klang Heritage Walk starts and ends. Tip: As you enter Jalan Stesen from the railway station, there’s a popular traditional Chinese kopitiam (coffee shop) called Chong Kok Kopitiam (map) on your left. It’s a perfect stop for a quick breakfast before you head over to the Royal Gallery to start with the Heritage Walk. There are plenty of food and drink to choose from at the Kopitiam, but my recommendation would be two half-boiled eggs on a toast, with either iced black coffee or a cup of hot tea. In my opinion, the prices here are slightly high for a kopitiam (I paid MYR8.50 for the eggs, toast & cup of tea) but you can’t fault the traditional ambience & atmosphere here. Tip: Between the Kopitiam and Royal Gallery, there is Klang Post Office, right in front of which you’d find Klang’s “Kilometer 0” mark (map). By now, if you’re still hungry for some more historic buildings and noteworthy architectures, you can proceed to walk northeast along Jalan Raya Timur from the Railway Station where in just a few minutes you’d find some pre-war shop lots. About 20 minutes’ walk from here, you’d find Masjid Diraja Sultan Sulaiman (Sultan Sulaiman Royal Mosque) on Jalan Kota Raja. Masjid Diraja Sultan Sulaiman is a royal mosque – with a direct link with Alam Shah Palace through the “royal stairs” – that was built in the 1930s. Its architecture and design were based on a combination of art deco, neo-classical and English architecture as well as Moorish, making it one of the most unique mosques not only in Selangor but also in Malaysia. Currently, however, it’s closed to the public as it undergoes some refurbishment work. What? Royal Klang Heritage Walk is a free guided walk jointly organised by Tourism Selangor and Klang Municipal Council. The 3 km trail follows footpaths in and around Klang city centre. It is conducted in English and takes about 2.5 hours to complete. When & Where? The Heritage Walk takes place on weekends, every Saturday and Sunday and starts with a registration at Sultan Abdul Aziz Shah Royal Gallery at 9.00 am. Bottled water, small backpack, camera and money for some food & drinks. Have you been to Klang, Selangor? What do you think of it? If you haven't, would you consider it if you're in Kuala Lumpur? I participated in Royal Klang Heritage Walk as part of #EatTravelWrite Klang programme that was organised by Tourism Selangor, Gaya Travel Magazine and Selangor State Govt. (Selangor Youth Generation Development, Sports, Cultural and Entrepreneurship Development (UPEN)). Going to Klang, Selangor for more than just a day trip? We recommend Aliya Hotel Klang for your accommodation requirements there. I love love love that the council is offering free heritage walks - it's such a smart way to promote the area's history. We have an annual series here in Ottawa (called Jane's Walks after a famous urban planner) and I always learn so, so much about my own community - it's always neat how you see something differently after participating in something like this. That's so true, Vanessa. We get to learn more about our own community and town through walks like this. It's a good thing that there are more and more heritage walks being offered here in Malaysia. In Kuala Lumpur alone, there are already at least 4 free guided walks offered by the local council. And of course, there's this one that's offered in Klang. Wow! Super detailed post. Thank you for putting together all this useful info! I love free walking tours and this looks like such a good way to really get their history and culture across. Thanks, Anna! I love walking tours too. In fact, it's usually one of the first things that I do when I arrive at a new city during my travels. Not only they give you insights about the history, cultures, etc. of the place, they also give you the opportunity to familiarise yourself with the town so that you can easily get around on your own later. The view of the mosque from Jambatan Kota looks amazing -- great tip to go there! This seems like a great way to get out of KL for a day and explore a less-visited city! Hi Carrie, Klang is certainly a good choice if you're looking to get out of KL for a bit but do not want to travel far. These days, if I go to Klang, Jambatan Kota is always one of my stops - simply because of the view of the mosque. I've been to KL a few times and have never even heard of Klang! This looks like such a great place to get away from the craziness of KL — I might just stay there instead of inside the city the next time I pass through Malaysia! That's the thing, it's such a shame that Klang is hardly recommended to foreign visitors even though it's located just about 1 hour from KL. But if you want to see a charming historical town with authentic local food, I'd certainly recommend it. Banana leaf rice AND kedondong juice - how freakin delicious is it, and really good for you too. I had a little heat stroke when travelling in south east asia a few years ago, they served me a glass and I bounced back so quickly. All about walking tours, especially cool it was free. Haha! I love kedondong juice! Unfortunately, it is so hard to find restaurants offering it so when I found it in Klang it felt like striking a lottery! So heavenly on a hot day, what more after doing all the walking! Thanks, Sherianne. I would now always bring my overseas friends to Klang if they have an extra free day whilst in Kuala Lumpur. It'd make a nice change from the hustle and bustle of the capital city. I like that this is a free walking tour. I will definitely include this in my itinerary. I feel like you learn a lot from these free tours. This seems like a great way to get. Great description. Thank you so much for sharing a great information. How cool is that that you can take a free heritage walk! I would love to take advantage of that! I visited the National Mosque in KL and I've loved visiting mosques since. The Royal Mosque is a place I'd love to post! Great tips for a memorable visit to Klang! I love the National Mosque! It is so Instagram-able, haha! Hope you had the chance to do one of the free walking tours in KL too, by the way. Wow, you've highlighted some incredibly beautiful sights of Selangor. I'm sorry I missed this town while visiting Kuala Lumpur! The view of the mosque reflecting on the river is stunning, I can't think of a better place to enjoy a sunset. The timing of this post is perfect as we'll likely be in Malaysia next year. Thanks for such a detailed itinerary, looking forward to exploring Selangor! Thanks, Heather. Great to know that you're coming back to Malaysia next year and are considering to cover more of Selangor. That's just so awesome! Heritage walks like these are what it's all about for me when I go to a new country, especially somewhere that is steeped in so much history like Malaysia. I have yet to visit but I'll definitely be making a pit stop at Selangor, so many beautiful and historical places to visit. You had me at heritage but the vibrant and beautiful photos of some of the cool street scenes have sold me! Ah-ha! It's the same with me. Heritage walks are usually one of the first things that I do whenever I arrive at a new city. Selangor sure has plenty of interesting spots and attractions to visit and they are all not that far from Kuala Lumpur. At least not as far as Penang or even Melaka. Such interesting places to visit.